Justice had heard about terrorist activities and brings SuperPatriot to invade a stronghold that belongs to the Hydro organization. Their commander is Baron Potentate and he announces that their ultimate goal is to return humanity to their water-breathing origins and takeover the world’s oceans. They have captured a number of Hookers from Atlantis whom they believe hold the secret to unlocking the ability to exist underneath the waves. A plan is concocted by SuperPatriot but his attempts to get his son to follow suit fail as Justice simply does not understand his directions. He decides to go it alone and shoots Baron Potentate’s hand off that had been holding a detonator switch that would blow up his prisoners. Justice is sent after this device but a huge robotic vehicle crushes him. SuperPatriot looses his temper and uses his nanotechnology to control this machine and uses it to kill the majority of the terrorists present. The recently empowered Johnny Armstrong is given a superhero costume at the White House before adopting the guise of SuperPatriot. He soon returns to fighting World War II and his new abilities enable him to take out numerous Nazi threats without his soldier allies having to endanger their lives. This recollection had been a dream of SuperPatriot and he wakes up start his daily routine all over again, heading to the newsstand where Claire Bono is waiting for him. SuperPatriot agrees to go on another date with Claire but is forced to call and cancel when an emergency situation arises. He accompanies Liberty & Justice in boarding a mammoth aircraft that had served as the headquarters of the government’s now defunct G.U.A.R.D. organization. They had taken badly to being dissolved by President Bush and take him hostage, trying to prove how easily the nation’s enemies could do the same without them on the job. 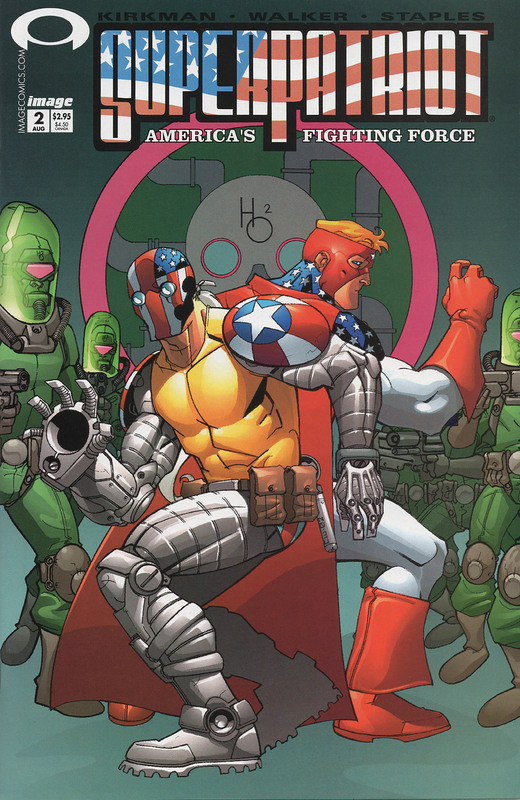 SuperPatriot guns down the former government operatives and liberates his commander-in-chief. A confused BrainiApe has his past life explained to him by Baron Blitzkrieg, starting from when the Nazi Party suffered defeat during World War II, partially due to the involvement of SuperPatriot and Mighty Man. Adolf Hitler and his remaining forces fled to Brazil before setting up a new party in Romania which was torn apart by American agents. Hitler had been wearing a suit of armor that’s nuclear core was breached and exploded. Blitzkrieg managed to save Hitler’s brain and had scientists attach it to their experimental super-ape. Their radiation treatment erased his memories and he went wild, killing the scientists before being brought to the United States as a curiosity. He soon went on to become the Vicious Circle thug known as BrainiApe which led to his current existence. BrainiApe is taken back to the new Nazi Party’s headquarters where he relieves Blitzkrieg of command. After returning home to his apartment, SuperPatriot is surprised to find Claire there waiting for him, having been given his home address from the newsstand operator. She merely wishes to know if their date had been cancelled due to a lack of interest on SuperPatriot’s behalf. He assures her that he simply leads an unpredictable life and they finally go on their date. Later that evening, SuperPatriot sits up in bed after having slept with Claire and feels as though he has acted inappropriately.